All I can say is, Hot Dog! What a fun idea. Pizza dough and hot dogs woven into a delicious edible rug that you cut up any size you want and dip into your favorite condiments! Who knew two ingredients could be the talk of the table? Plus, you’ve got to love the idea that by adding only two more ingredients, you’ve got the gourmet version. The rug starts with a rolled out sheet of refrigerated pizza dough sliced in strips that are laced like a lattice pie crust. 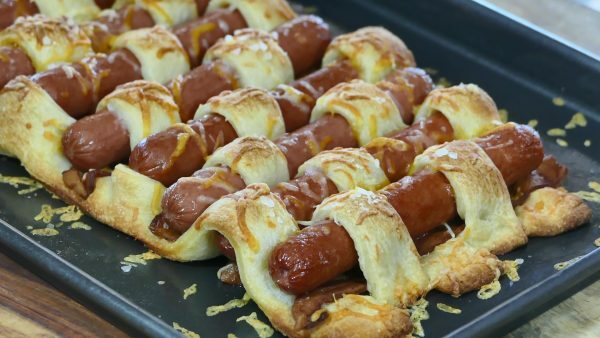 The hot dogs get woven into the lattice and baked. Now, if you add bacon and cheese, you’ve got the super-sized version! Both versions get melted butter and coarse salt, so it’s a little like a soft pretzel wrapped around a hot dog. This is such a simple kid-friendly idea for snacks, lunch or dinner poolside with a refreshing beverage. It’s also my new favorite way to dip and devour two of our very favorites; pizza and dogs! Preheat oven to 375 degrees. Roll out pizza dough on a lightly floured surface. Use a sharp knife to cut the dough into seven even lengthwise strips. Transfer the strips to a greased baking sheet. Starting at one end, fold back first, third and fifth strips. Place a hot dog on the flat strips then fold those same strips back over the hot dog. Next, fold back the second and fourth strips over the hot dog and place a second hot dog down. Continue to weave all eight dogs into the bread in this fashion. Fold back first third and fifth strips. Place bacon strip on dough. Sprinkle with cheddar and then add the hot dog. Continue to weave the dough as directed above. Brush melted butter over the finished weave and sprinkle with coarse salt. For the Deluxe version, sprinkle with cheddar cheese. Bake at 375°F for 25 minutes or until golden brown. Let the weave cool for 5 minutes and then cut into pieces. Serve with ketchup, mustard, ranch dressing or any of your favorite condiments.